I usually do not post much about my other cultural policy interest apart from heritage policy, which is in the area of urban cultural policy and particularly the question of what cultural scenes consist in and what role -- if any -- various kinds of cultural scenes play in the life of cities, including their economic life. But the travails in Detroit are raising the specter of their museum being forced to sell off its collection, and at this moment when we most need thoughtful and helpful responses, I was appalled to read this from the New Yorker's art critic, Peter Schjeldahl. You should read it for yourself, but I would characterize the gist as: "I don't know much about economics, being an art critic and all, but it is a 'no-brainer' to sell the DIA art collection because the choice is sell or cut pensioners' pensions." "No-brainer", indeed, but not in the way Schjeldahl means it. The art critic appears to believe that selling would simply generate funds that would far outstrip the loss of tax revenues that the museum would otherwise generate. It is true that if the museum were closed the city's tax revenues would probably be reduced immediately by only $10-15 million, not anywhere close enough to offset the gain from whatever the museum could sell off in that year. But the economic impact of the museum is in no way captured fully by counting only tax revenues generated by tourists. Museums, and other arts, along with the various amenities that altogether constitute a city's cultural scene, are magnets for human capital. They attract not just tourists but residents (usually college-educated, but certainly likely to be creatively inclined do-it-yourselfers, to which the word "entrepreneurs" might be applied were it not in such bad repute) who might decide to move to or stay in Detroit because, yes, they have an amazing art collection (among other cool things). The future of Detroit depends on its ability of its city core to successfully compete for those people moving forward, because of the tax revenues they would generate. Those revenues that would continue indefinitely and that I imagine (though I have not done the analysis myself, I admit) would dwarf the $10-15 million in direct and indirect economic impact from tourists. Detroit's ability to do that will take a big hit if the museum is liquidated -- not just because the art itself will be gone but because the sale will signal that the city has given up on its core's future altogether. All this should be obvious to anyone who takes a few minutes to scratch the surface of the issue, but our art critic relies instead on his privileged gut. "No-brainer" might be Schjeldahl's epithet going forward. The New Yorker should be ashamed of accepting this kind of idiocy, and should fire him. 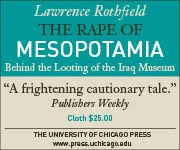 Amongst many of my comrades who like me are trying to find ways to more effectively address the problem of looting of antiquities from archaeological sites, it is an article of faith that if we can reduce the demand for antiquities by collectors and museums in the US and Europe then looting will be reduced concomitantly. Hence the self-congratulations when museums in the US finally adjusted their acquisitions policies, for instance. But as I have argued, this is a naive view based on the mistaken assumption that the global market is dominated by Western collectors. The reality is that there are plenty of collectors from other parts of the globe whose demand is more than adequate to fuel looting. Mr Tsoukalis believes the most popular buyers are Russians, Chinese and Latin Americans. "They are more likely to either sell antiquities in their possession or search for them in abandoned excavation sites, in order to sell what they find to dealers who take them abroad. "We've tracked down ancient Greek antiquities as far away as Colombia - in the hands of drug dealers". Does this mean that we should ignore what the collectors in the US and Europe are doing? Absolutely not. But it does mean that prohibitionism or just-say-noism is not going to do much of anything to stop looting, and that we need to think harder about other strategies that might do more. Spoiler alert: that doesn't include talking the Russians, Chinese and Latin Americans into just saying no -- but it might involve figuring out ways -- maybe through tourism revenues, maybe through a US tax on sales of antiquities to American collectors -- to fund better site protection and more people like Mr Tsoukalis. In response to the latest footage showing, again, shelling of World Heritage sites in Syria, the head of UNESCO has issued yet another in a series of futile calls for an end to such destruction. What is most depressing is not just that these appeals are almost certain to fall on deaf ears, but that Ms. Bokova is missing the opportunity to call for changes that need to be made in the international instruments she cites -- changes that are desperately needed if there is to be any hope of reducing site destruction going forward -- whether such destruction is due to military action, as in the case of Syria, or to the actions of antiquities looters who operate with impunity in these conditions. Take the 1954 Hague Convention, which was designed to discourage States Parties from firing at sites or pillaging them. As the article notes, "In an earlier statement, Ms. Bokova had said that 'destroying the inheritance of the past, which is the legacy for future generations, serves no purpose except that of deepening hatred and despair and it further weakens the foundations for cohesion of Syrian society.'" It is true that one effect of of destroying World Heritage sites is to deepen social divides, and in the case of the Taliban that was certainly the purpose. But as a matter of fact, the Hague Convention itself recognizes that there might well be a good reason for shelling a World Heritage site -- if the enemy has moved onto the site, the Convention says, anything goes. Whoever moves onto a site first is culpable in that case. For the Hague Convention to do any good in the Syrian context, then, Ms Bokova would need to go beyond vague appeals to warring parties to cool it, and instead urge that the international community to do what it would take to hold accountable whoever moves their forces first onto a site. Why does she not call strenuously for an international monitoring system capable of putting eyes in the skies over World Heritage sites in conflict zones, so that those who move first onto the sites can be identified and then indicted and prosecuted? The other international instrument cited by Ms. Bokova, the World Heritage Convention, is similarly hamstrung when it comes to dealing with Syria-style threats. The Convention itself has always been overblown about the protection it provides to the sites listed -- looting may have been one of the threats mentioned but from the beginning the more important threat was defined as that caused by development or by neglect. And the aim of the list was to incentivize governmental investment in conservation and planned tourist development. What happens, then, when war breaks out? Tourism is non-existent. That makes the threat of de-listing -- the only stick that the Convention provides -- relatively unimportant, in the short run, which is the only run that matters when a state is at war. Is there any change that could be made to the Convention's listing procedures to give it some relevance in situations like Syria? Yes. For starters, to get or stay on the list, UNESCO could require countries to submit a disaster preparedness plan for approval. A more robust change would require countries to contribute a percentage of tourist-generated tax revenues to an international disaster-response fund, a kind of insurance policy. These are, admittedly, not necessarily easy changes to effectuate. But that is all the more reason for the head of UNESCO to be forcefully advocating for them, or for some other innovations. The problem is too dire to settle for the usual "I am shocked" pronouncements.